Submissions of Forest Management Reference Levels by Parties of the UNFCCC in the context of carbon accounting rules in the Land Use, Land-Use Change and Forestry sector. 14 European countries (France, Italy, Spain, Luxemburg, Belgium, the Netherlands, Rumania, Bulgaria, the Czech Republic, Hungary, Lithuania, Latvia, Estonia and Slovakia) relied for their Forest Management reference levels on model-based projections by two forest resource models EFISCEN and G4M. Assessments of forest resource development in all European countries in the context of the UNECE and FAO European Forest Sector Outlook Study II. Estimations of woody biomass potentials for material and energy use in all European Union member states in the context of the EUwood study for the European Commission DG Energy to study. 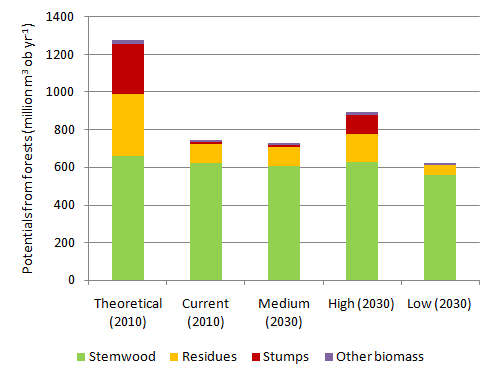 Wood and biomass potentials from forests in EU-27 for different mobilisation scenarios in 2010 and 2030, as estimated by EFISCEN in the EUwood study. The list of publications provides an overview of all published model applications.